Winter is a spectacular season. The world is a completely different place when it’s covered in ice and snow. 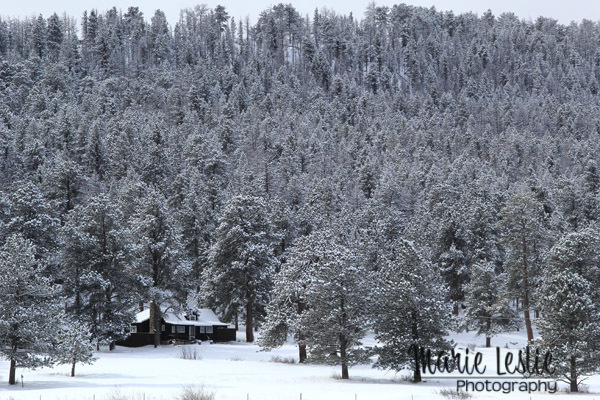 Despite being my fourth winter as a Coloradan, I have not spent nearly enough time out capturing winter with my camera. So when my husband asked me what I would like to do for our anniversary this year, heading for the mountains was right at the top of my list. Rocky Mountain National Park is my favorite national park. I first fell in love with it more than 25 years ago. I have been there in summer, in spring and in fall, but I visited the park only once during the winter–and didn’t actually get to travel beyond the Beaver Meadows entrance because of the weather. 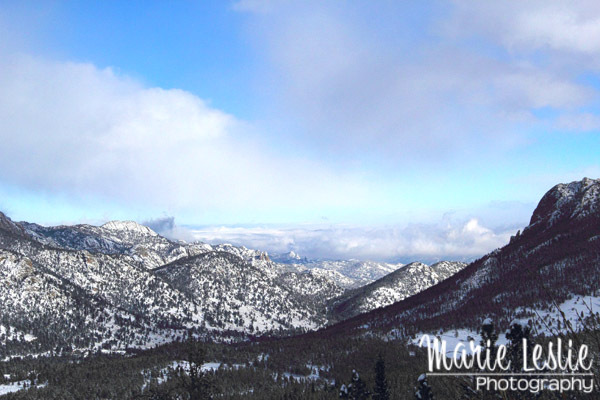 Needless to say, winter photography in Rocky Mountain National Park has been on my wish list for some time. And I must say, it didn’t disappoint. Thankfully, it wasn’t terribly cold–at least not during the day. Our outing included an opportunity to try out our new snowshoes (tons of fun!) and lots of exploring in a very uncrowded park. I love the snow-covered trees; they look so different from summertime. I am sure I took far too many photographs, but it’s not something I’ll be apologizing for–besides, I’m the one who has to sort through and edit them all. Better to take a few too many than to miss the one that turns out to be the prizewinner. 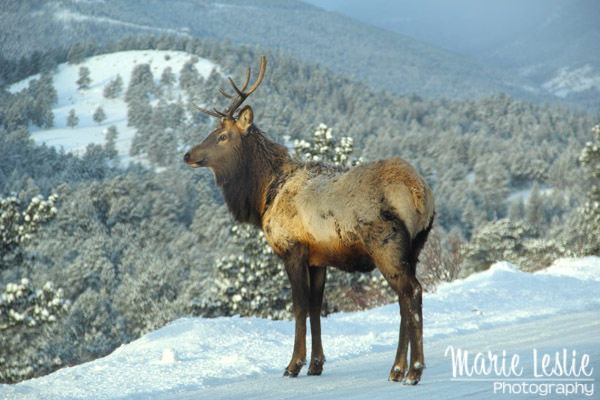 We saw elk and deer in abundance during our stay, but not a lot of other wildlife. I’ve still yet to see a bighorn sheep or mountain goat inside the park, though I have now seen them many times in Big Thompson Canyon and in other parts of the Rockies. We also saw them much closer up than we’ve seen them in other seasons, partly due I think, to the much lighter human traffic. 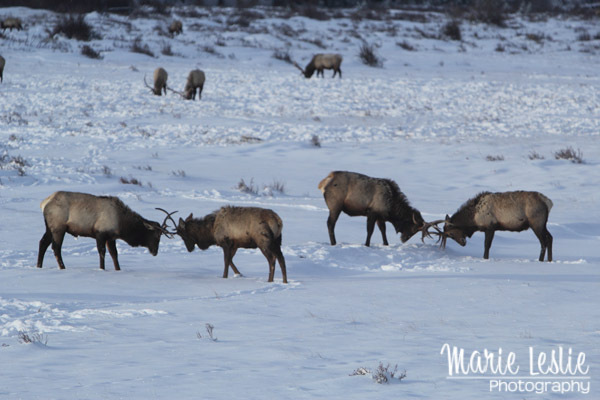 We watched these young elk at their practice rutting over in the Sheep Lake section of the park. I thought it rather interesting that nearly all the bull elk we saw (except the one above) were in the Sheep Lake section. And all the female elk were at the far south end of Beaver Meadows–about as far apart as they all could get. The views were spectacular at every turn. This afternoon image from Fall River Road looks east over the Sheep Lake area. We were blessed with fresh snowfall both nights of our stay, but sunshine during the day, creating beautiful crisp vistas throughout the park. One of the highlights of the trip for me was convincing my husband that he should get up at 4 a.m. and drive me up to the park so I could try my hand at astrophotography. It was definitely cold–something below zero with about a 20-mile per hour wind. While I’m not unhappy with the result, I think my next attempt will be in summer. Thankfully, Estes Park boasts a Starbucks that opens very early and serves my favorite caramel apple cider. 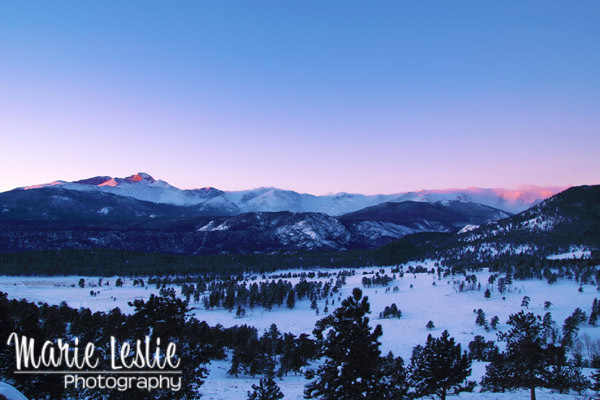 After our detour into Estes Park, we headed back up into the park to capture the sunrise over Longs Peak. Yes, it was well worth getting up at 4 a.m. and standing out in sub-zero weather. I am already trying to figure out how to get him to go up again before spring. To prepare for my winter photography expedition, I follow the tips I wrote about in this post about winter photography. Preparation makes all the difference. Warm boots, lots of layers, good gloves and something warm to drink made the minus-something windchill bearable. So did the view. You can find more photos from my winter outing on my Facebook page or on Google+.